Bangladeshi people are showing signs of frustration with political leadership that is preoccupied with mud-slinging. They are losing trust in state institutions. Stuck in political limbo, they have no higher authority to turn to. This in turn encourages third parties to fish in troubled waters. 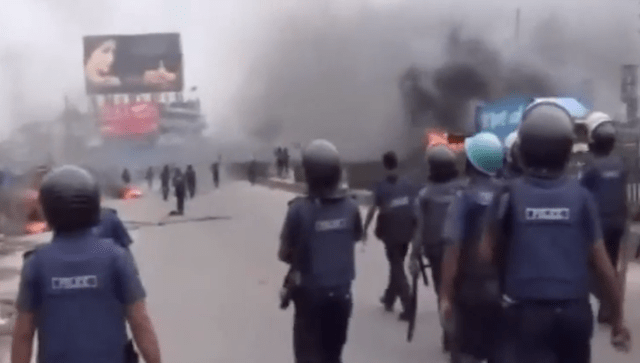 Bangladesh has seen unprecedented increase in political violence since Prime Minster Hasina Wajid was reelected in an election, widely seen as fraudulent. An event that many hoped would bring Bangladesh’s ailing democracy to life turned out to do the exact opposite. Residents of the country’s two largest cities went to the polls recently to elect their mayors along with a legion of council members. The candidates backed by the ruling party, the Awami League, won by large margins. Post-election statistics were too neat to fool anyone into believing the prime minister’s claims of a free and fair election. Indeed, the reality was very different. Shortly after the vote began, party cadres of Awami League took control of a majority of the polling centers in both cities. Polling agents from the opposition party, the Bangladesh Nationalist Party (BNP) were warned not to come to their assigned centers. Those who came were forcefully expelled by League thugs. BNP candidates boycotted the election around noon. Reporters and journalists did a great job covering the election, although they themselves were subject to harassment and attacks. Even the Swedish envoy to Bangladesh, who was visiting a center, was caught in an altercation among the League cadres. The ambassador was later rescued by the security forces. Vote-rigging, violence, and intimidation is nothing new in Bangladesh. That said, the scale seen in the elections at the end of April was unprecedented. In particular, the way local administration officials and police were made to work in tandem with the thugs of the ruling party shows the election was anything but an exercise of institutional democracy. The international community, including the United Nation, the United States, and Britain, was quick to express its dismay. Foreign diplomats stationed in Dhaka had been working for months to get the two rival parties to the negotiation table. So was Ban Ki-moon, the UN chief, with his own ongoing pleas. Parties involved in the mission to find a solution to overcome the political impasse agreed on one point: Democracy must be given a shot. The city government election, therefore, became a litmus test for the future of Bangladesh’s democracy. Click here to read the complete article at The Diplomat. Arafat Kabir is a global and regional affairs commentator and analyst. A regular contributor to International Policy Digest, his articles have appeared in the Wall Street Journal and The National Interest. Currently, he is pursuing a Masters degree in global politics and culture at Illinois State University. South Asia runs the grave risk of becoming caught in the US-China turf war and being forced into non-inclusive and unbalanced trade relations. Immigration experts explain who's really trying to cross the US-Mexico border, what they want — and why immigration, even undocumented immigration, actually benefits the country.